Okay, how do we know Rajinkant is a superstar? Well, because the opening titles misspell Aishwarya Rai Bachchan’s surname, and the Bachchans haven’t boycotted the film. Because he is the only who can have 112 missed calls from such a beautiful woman. And because only he can shoot with his finger. A Rajni film is not just a two dimensional experience. It’s a 360 degrees experience which involves getting plugged into the energy source. There are three Rajni’s for the price of one, well actually, a 100 in the extended climax. This is a film that makes Bollywood look puny in both its imagination and intent. 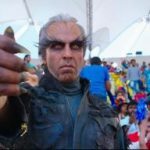 It has special effects that have never been seen before on Indian screens–a shape shifting giant, a snake, a human train. Just think, and Shankar does it. 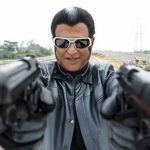 It also has powerful emotional scenes, surprisingly involving the scientist and his creation, Chitti, who can dance like Prabhudeva, fight like Bruce Lee, and love like Rajni. 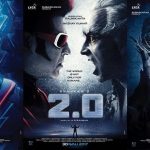 There’s a big moral dilemma at the heart of the film, about man and machine, and what makes us human (love, of course, especially if the object of our affections is Aishwarya Rai). We know Rajni is the rational, thinking scientist, because he reads Freakonomics and Stephen Hawking, because he speaks in English when he gets angry (irresponsible idiots, shocking surprise, he says) and because he doesn’t have time to reply to Aishwarya Rai’s emails (silly man). Rajni can do anything. He wears big wigs and short wigs, goes bald and sports a white streak, dances and plays the guitar, gets kissed by Aishwarya and has her kissing him back. The robot is a delight–unlike the rival Danny’s robot, he doesn’t confuse a bun with a gun. Little wonder then that Aishwarya calls him her toy friend, not boy friend. But my personal favourite is the third Rajni, the one who can float like the Green Goblin and fight like Darth Vader. He snarls, clones, laughs madly and grabs Aishwarya as if she was a luscious fruit (she looks particularly beautiful here, a fitting queen for a king). So anyway, Rajni walks sideways, runs on trains, flies, sprouts wheels, even talks to mosquitoes. He also tells us in a wonderful scene what humanity is all about. There’s a me too 3 Idiots scene involving the birth of a child and lots of wasteful footage involving giving of roses and showering of praise, but the film’s climax is worth the wait. Rajni tells us why robot sapiens are superior to homo sapiens. It also tells us that it’s Happy Diwali, folks. 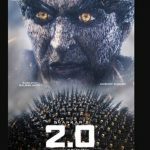 i like enthiran the robot it very exciting/ super! and il like the fight ,dance and all other stuff. In the movie there are lots of Rajinikanths which are robots transform into a ball and a snake. I like your very much! this the best science-fiction film i ever seen of Kalanthi maran and sun pictures!! Big fan of Rajinikanth, and big fan of film critic work: I think I am esielpalcy amazed at how someone who is ostensibly not Tamil has managed to understand the sheer spectacle and awe of Rajini’s body of work and his appeal to the Indian masses. Even within India it is hard to get people outside of the South to take Rajinikanth seriously; and I really think its amazing how you’ve managed to capture the essence of his movies so well and understand both the crazy/camp as well as the appeal! well done! I posted your Slate article on fbook and generally could not get over it! Hey. Neat post. There’s an issue with the website in crohme, and you might want to check this The browser is the marketplace chief and a large portion of other people will pass over your fantastic writing due to this problem.